One of the more fascinating ideas is that the ark somehow made its way to Japan, where it is said to have ended up at Mt. Tsurugi, in Tokushima prefecture on Shikoku Island. Mt. Tsurugi is 1,955 meters (6,413 ft) high, and is considered a sacred mountain that is inextricably tied to an ancient religion known as Shugendo, which features elements of both Shinto and Buddhism. But how does this tie to the Lost Ark of the Covenant? Why would this relic so linked with Judaism and Christianity wind up here of all places? The theory was first put forward by literary scholar and historian Masanori Takane, who in the early 1930s claimed to have found numerous strong parallels between the Bible and an ancient 8th century Japanese text on myths surrounding Shinto spirits and the formation of the Japanese Islands, called the Kojiki. Upon making his revelation, Takane carried out exhaustive research on the history, philosophy, and theology surrounding the two, and also delved deeply into geography and local names and folklore until he finally came to the firm conclusion that the Ark of the Covenant was buried somewhere at Mt. Tsurugi. Takane was so convinced that he had cracked the mystery on where the Ark was hidden that he began an excavation at Mt. Tsurugi in 1936, which amazingly uncovered mysterious stone artifacts, paving stones, tunnels, and a brick arch. These findings were promising, as they seemed to lend credibility to the idea that ancient peoples may have attempted to hide something within the sacred mountain, and thus the excavation became an obsession for Takane, who would spend the next 20 years tirelessly digging in hopes of finding the Ark. Over the years, Takane’s exciting initial findings attracted other would be archeologists to Mt. Tsurugi to try their hand at finding the Ark as well. One such expedition in 1952 attracted a good amount of attention when a former naval admiral by the name of Eisuke Yamamoto discovered what appeared to be marble corridors within the mountain, as well as human mummies that had decomposed. Weirdly, both Takane and Yamamoto suddenly and inexplicably stopped all further excavations and attempts to find the Ark shortly after this discovery. Why? No one really knows. One more excavation was carried out by a treasure hunter named Yoshun Miyanaka in 1956, but his efforts were brought to a halt by the creation of a nature preserve called Tsurugi-san Quasi-National Park, which includes Mt. Turugi and much of the surrounding area in 1964. This new status as a nature preserve made it illegal to conduct archeological digs on Mt. Tsurugi, and so Miyanaka was forced to abandon his valiant search empty handed. It also meant that no one else would be able to look for the Ark here, and all of the the artifacts, tunnels, corridors, and mummies that were found within the mountain will likely forever remain an enigma. As odd an idea as it may seem that the legendary Ark of the Covenant made its way to all the way to Japan, there are some interesting parallels between its appearance and that of Japanese omikoshi, which are portable shrines that are typically carried about during festivals. Omikoshi are carried on the shoulders with the use of two poles, which are attached to the bottom, very much like the way the Ark was carried, with its two poles similarly attached to the bottom rings of its “four feet.” Additionally, whereas the Ark featured two gold statues of a type of winged angel known as kruvim, Japanese omikoshi also feature a gold statue of a heavenly bird known as a ho-oh. The size of the Ark is also almost exactly the same dimensions of a typical omikoshi, and omikoshi are typically overlaid with gold, just as with the Ark. There are also other interesting links between the customs of ancient Israel surrounding the Ark and those of Japan. For example, it was said that King David and the Israelites sang and danced in front of the Ark to the sounds of music, and during festivals, Japanese sing and dance around omikoshi with music playing as well. In one festival in Kyoto at the Gion shrine, men perform a ritual where they carry an omikoshi across a river, a remarkably similar scene to the ancient Israelites carrying the Ark through the Jordan River during their exodus. In some areas, the bearers of omikoshi sanctify themselves with sea water before carrying it, which is very similar to the ancient Israelite custom of performing a sanctification ritual before carrying the Ark. Additionally, when the Ark was carried into Jerusalem, it is said that David distributed a loaf of bread, a piece of meat, and a raisin cake to every single Israelite, which seems to somewhat resemble the Japanese custom of passing out sweets to everyone at the conclusion of a festival. At the festivals of many Shinto shrines, the priests who carry the omikoshi wear white, linen robes just as the Israelite priests who carried the Ark did. 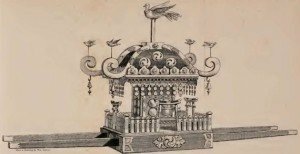 Is this all just mere coincidence, or was the design of omikoshi and the customs surrounding them possibly influenced by ancient contact with Israelites carrying the Ark of the Covenant? To this day, it is not known where the Ark of the Covenant is, nor even any truly concrete evidence to show that it was ever even real. What is known is that as long as the allure and mystique of this great lost religious artifact remains, people will continue to search for it far and wide. Maybe, just maybe, it is hidden away in some dark, subterranean corridor beneath Japan’s Mt. Tsurugi, far from its native land and just as mysterious as ever.